Sold as 5 UNITS at $11.88 per unit. (1 unit = Pk/5.) 10 watt = 40 watt equivalent. 8000 hours. 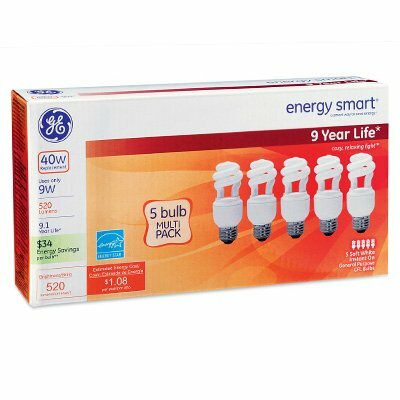 Saves $24 in energy costs over life of bulb. Energy Star rated. Lasts 5 years. 520 lumens. 5 pack. Boxed . Manufacturer number: 73156. SKU #: 3261658. Country of origin: China. Distributed by G.E. Lighting.